Booking cancellations are a rarity for most owners, but it's important to treat them professionally so that your guest and third parties have all the information they need. 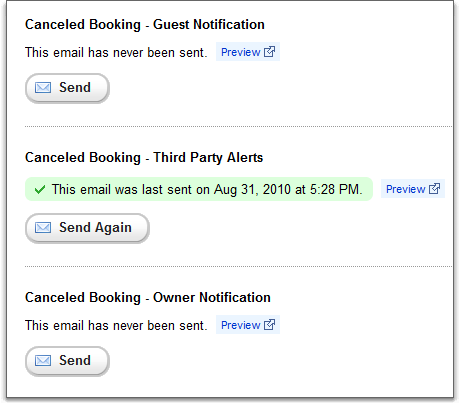 You can now decide when (or if) you want to send emails for cancelled bookings. Previously, when a booking was canceled, the system simply sent out standard emails straight away. In some cases, the guest was never notified of the booking to begin with so there's no reason to nofity them, or any third parties, that it was canceled. Under the Email page for the booking, you'll see three new types of email to send. You'll only see these email types if the booking is canceled. Just like the other email types on the page, if the canceled emails were already sent, it will show the last time each one was sent. You can send these email types again and again. You can also use the Preview option to see the email exactly as the receipient will see it. The cancellation page has a new section called Email Options that is similar to the ones on the Change Dates and New Booking pages. As with those pages, you may select which emails you want sent at the time of cancellation. 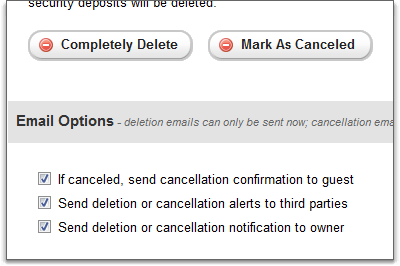 If you are deleting the booking - as opposed to canceling it - the emails can only be sent at the time of deletion. This is because the deletion process completely removes the booking from the system, including all related email information. Good email options are vital to a booking system because it's the communication pipeline between you and your guests. Our goal is to expose every email point in the system and let you configure it, choose if you want to send it and provide options to send it later. Adding email options to cancellations brings us one step closer to that goal.